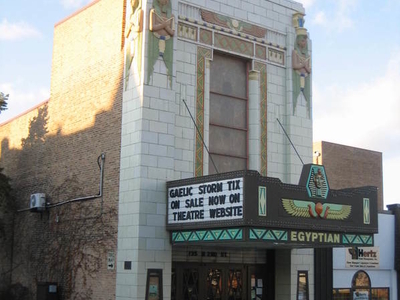 The Egyptian Theatre in Dekalb, Illinois, United States, is an Egyptian Revival theatre that is listed on the U.S. National Register of Historic Places. The theatre was built in 1928 and 1929 as part of a much larger wave of national fascination with Ancient Egypt throughout the United States, due, in large part, to the discovery of King Tut's tomb in 1922. The theatre was added to the National Register in 1978 and its 1,430-seat auditorium is currently DeKalb County's largest. 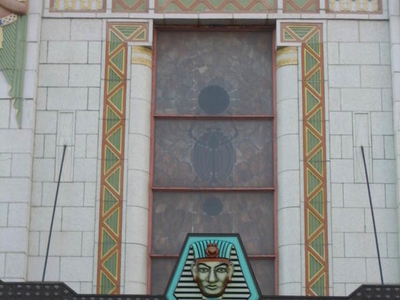 The building was designed by architect Elmer F. Behrns, who had an interest in Egyptology. The interior and exterior architecture reflect Egyptian cultural symbols. Stained glass work exhibits designs such as Ra, the Egyptian sun god and the scarab, a sacred Egyptian symbol. The building was nearly demolished in the 1970s but a restoration effort led by Preservation of the Egyptian Theatre (PET) saved the structure. Rumors have long surrounded the DeKalb Egyptian about secret messages hidden in the architecture and hauntings. While the theater maintains there are no hidden messages in the theater the ghost stories have persisted through the years. The Egyptian Theatre operates a 42-week season with up to 125 events annually. Here's the our members favorite photos of "Theaters in Rochelle". 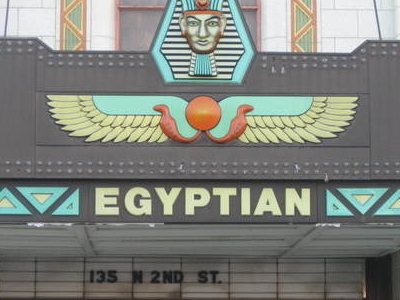 Upload your photo of Egyptian Theatre! Connect with Felix Fem and Ehab Saber who are looking to visit Egyptian Theatre.